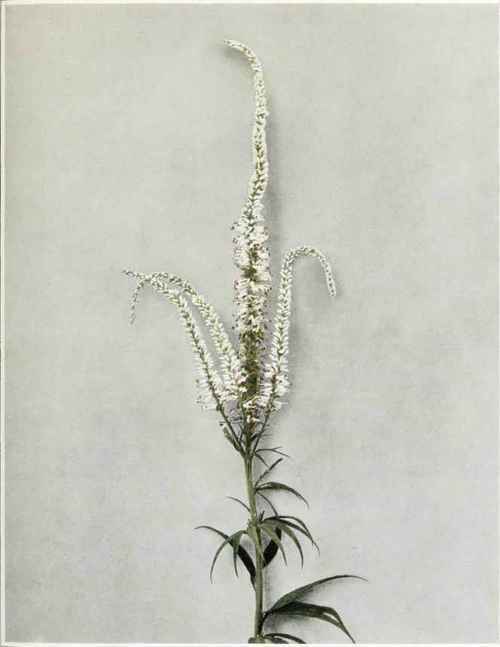 A tall, stout, erect herb with smooth stems, branched only at the inflorescence, 2 to 7 feet high. Leaves whorled, three to nine leaves at a node or some of the upper ones opposite, lanceolate or oblong-lanceolate, long pointed at the apex, narrowed and short petioled at the base, the margins finely sharp toothed, smooth on both sides, or slightly hairy beneath, 3 to 6 inches long. Flowers small and numerous in dense spikes, 2 to 9 inches long, terminating the stem and branches of the inflorescence. Calyx four-parted with pointed, ovate-lanceolate segments. Corolla tubular, white or bluish, about one-sixth of an inch long, with four nearly equal lobes which are about one-fourth as long as the tube of the corolla. Stamens two. and like the style projecting beyond the flower. Fruit an ovoid-oblong capsule, two to three times as long as the calyx. In moist woods, thickets and meadows, often along old roads, Ontario to Manitoba, south to Massachusetts, Alabama and Texas. Flowering from late in June until early September.